Evolutionary scientists are baffled about a study where a mutation has seemingly been reversed, and that's not supposed to happen. Selective breeding yielded carp without scales, which made it faster and easier to get them onto the dinner table. Some of the critters got out of Dodge and back into the wild. The scales grew back in their descendants. Did you know that koi and goldfish are carp? The Darwinistas were resorting to the frequent empty phrase, "evolutionary convergence", but it really shows once again that genetics is not understood as well as some people may think. At any rate, the fish is still a fish, and are still carp. Adaptation? You betcha! God created things with the ability to adapt to changing environments, which is expected by biblical creationists. No need to applaud Darwin, he has nothing to do with it. Back in the 1800s, Europeans bred carp until the breeders crafted a small population that lost all its scales. Carp without scales are easier to clean in preparation for cooking. In 1912 some of these scale-free carp were transported from France to Madagascar, which had no native carp populations. Within a few decades some of the carp escaped and colonized natural Madagascar waters. Then in the 1950s, remarkably, some of the fish began re-growing the scales their captive ancestors had completely lost. Scientists puzzled over how these fish were able to regenerate a supposedly erased trait. New genetic analysis tools should help collect answers. French and other biologists recently sampled 686 carp from both farm stocks and the Madagascar wilds. They counted scales and ran genetic tests, publishing their shocking result in the Proceedings of the Royal Society B. 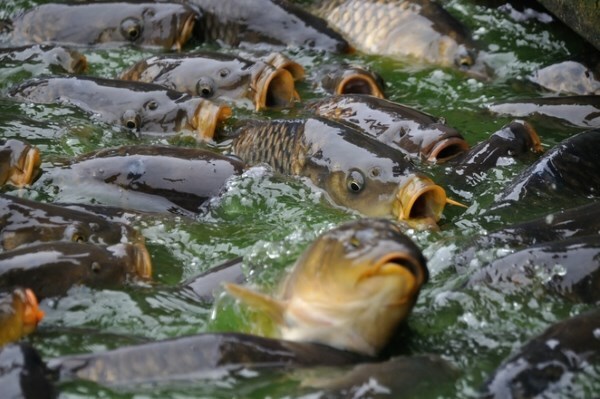 The team's analysis revealed that most of the wild, scale-bearing carp had the same mutation that causes other carp to grow up without scales. During captivity, the mutation had disabled an enzyme normally required to develop scales. To read the rest, click on "Wild Carp Rapidly Regrow Scales". You may also like to see, "Selected Carp Devolved Rapidly to Wild Type".